If you have a localised area of fat it is possible to reduce its bulk by an operation called Liposuction. A narrow metal tube is inserted through a small incision in the nearby skin. 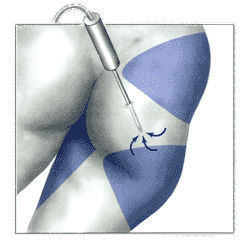 It is attached to a strong vacuum pump which is drawn back and forth within the area of excess fat. The process removes tunnels of fat leaving the nearby skin nerves intact. The skin will then retract. There are some minor variants in the techniques. Some surgeons inject the area to be treated with solutions (wet or tumescent technique) others do not. Suction is usually applied with a powerful vacuum machine, but it is some-times perfectly adequate to use a simple syringe for small areas. Ultrasound assisted lipectomy is another variant. You can expect considerable bruising which will be uncomfortable and at times painful. The larger the area treated the greater it will be. Some people bruise more easily than others. The discoloration of this bruising will usually last for about a month, but the lumpiness and swelling of deep bruising can take up to six months to disappear, particularly when the abdomen or ankles have been treated. As swelling can take a long time to settle you may not see the full benefit of the operation for up to six months. Rarely, a greyish stripe can discolour the skin for several months and is more commonly seen when the ankles have been treated. If you have a tendency to be anaemic, or if you were to have a large area treated, you may need to take iron tablets for a month. You can expect some numbness in the treated skin which lasts for several months. You will have small scars 1.0 to 2.0 centimetres long at the sight of insertion of the suction cannulae. There is a small risk in some people that these scars may stay red for a while but they are usually sighted in less obvious areas. If you are having treatment to your legs you may find that your ankles are swollen for a few weeks and if your ankles themselves have been treated, they may stay swollen for a few months. What should you do after the operation? Fat cells are thought not to be regenerated in adult life. Therefore their removal by liposuction will give a permanent change in contour and be independent of any changes in your body weight. It is important for you to understand that liposuction is not a treatment for obesity. The amount of fat that can be removed from a localised area is limited by what is safe (maximum of 3 litres) and a natural limitation when no further fat can be removed. Therefore it may not be possible to slim down an area as much as you might like. Further treatments may be carried out in the same area after six months. In certain situations the skin is inelastic and loose. Liposuction in these areas will then tend to leave the skin more loose and it may be recommended that a skin excision be carried out to correct this, either at the same time as the liposuction, or as a second procedure. This is most likely in the abdomen, after pregnancy or weight loss, the buttocks or the neck. Dimples and wrinkles of the skin, sometimes called cellulite, will not be improved by liposuction. What should you expect at the time of your operation? The procedure is normally carried out under general anaesthesia as a day case. You may wish to stay the night if you have had many areas treated. An epidural is an alternative for the lower part of the body, but a local anaesthetic alone is only suitable for small areas as it is uncomfortable to administer and does not work particularly well. You are likely to need simple pain killers for a day or so after the operation and you will probably be asked to return a week after surgery to have sutures removed. A snug pressure garment or corset is usually advised around the lower part of the body. This is used to reduce bruising but can be taken off to wash, quickly dried and put back on. You can take this opportunity to bathe yourself. The corset is usually worn for two to three weeks. A snug pressure garment is worn after surgery around the lower part of the body to help reduce swelling . You will only need to take a few days off work if a small area is treated, but larger areas may necessitate 7 to 10 days off work. You may be somewhat anaemic and need to take iron. You are welcome to sunbathe but remember that discoloration of bruising will last about a month and you will not achieve your best appearance for three to six months. The large majority of patients who have this operation done by an experienced surgeon run into no problems at all. You should, however, take into account the following: Any major operation which is done under general anaesthetic carries with it a small risk of infection and thrombosis of the veins. Heavy bruising can happen particularly in patients who have a tendency to bleed or have been taking aspirin or anti-inflammatory drugs. Serious infection is very rare, but there is sometimes inflammation in the areas that have been treated with perhaps some oozing from the incisions. It normally settles with a course of antibiotics. Thrombophlebitis (which is an inflammation of the veins and not the same as thrombosis) can occur around the inside of the knee and inner part of upper thigh when these areas have been treated. It gradually settles over a period of weeks. 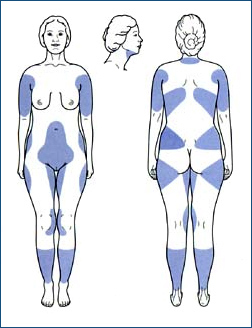 The surface contour over the treated areas can sometimes be irregular particularly if a lot of fat has been removed but if the technique is properly carried out these irregularities are minor. Occasionally the skin appears to be tethered to the deep tissues, this is part of the bruising and will settle in time. You should avoid aspirin and anti-inflammatory drugs for 2 weeks before the operation. You should take iron if you are anaemic. In addition remember that certain homeopathic medications such as gingko biloba have blood thinning properties as well, and should be discontinued prior to surgery.Occasionally your surgeon will advise you to stop taking the contraceptive pill if the liposuction is going to be extensive, perhaps involving skin excision.